As glossy and tough as car paint; a dream come true for women all over the world. XXL LacLine is an UV-nail polish. After every coat it is dried for 2 minutes under UV light, precisely this makes it so scratch-proof and resistant to knocks. At the same time applying it is child's play as with conventional nail polishes. Read here for the step by step instructions for correct application and removal. Nail polish blemishes, imperfectly finished nails, annoying wait for the nail polish to dry, matte nail surfaces, textile imprints, chipping, touching up the tips...all a thing of the past. Now you can style your nails in the blink of an eyelid and enjoy the flawless effect and a perfect mirror finish for 2 whole weeks despite going through the routine chores. Do you want to know what other XXL LacLine users think of this product? 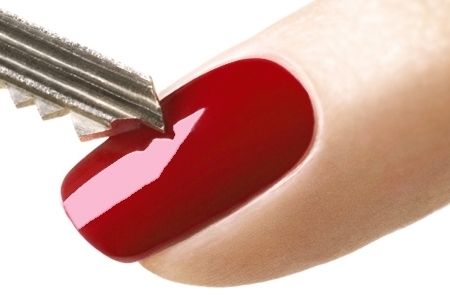 Finally, this revolution is now available even for end users and a genuine sales boost for nail stylists. Each bottle contains 8 ml of nail polish. Color was added to your cart.